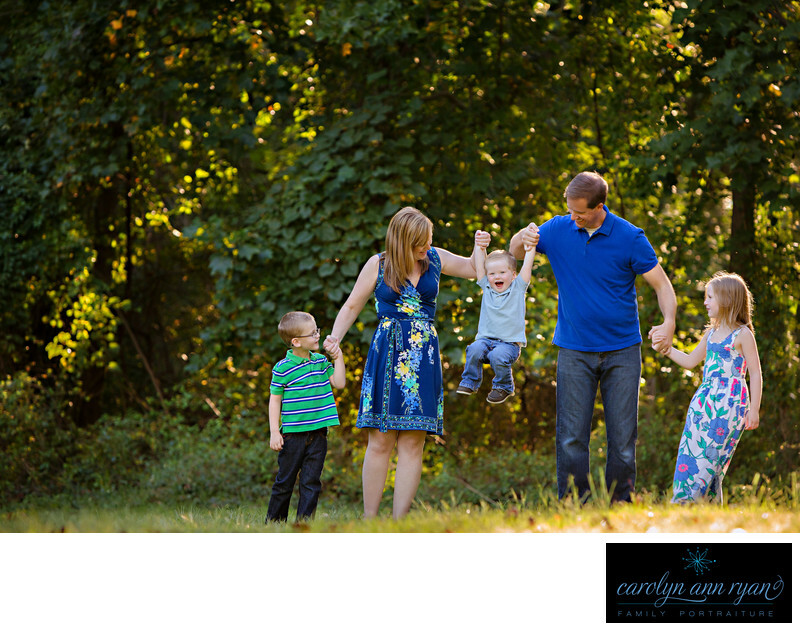 It was the last days of Summer and a perfect evening to squeeze in a family portrait session. School had just started, but it was still warm enough to wear Summer dresses and short sleeves. The air was crisp, and the sun was golden and this family was having a blast, and the little man was stealing the show. I loved how much the whole family adored this little guy. He was older brother's best companion, and big sister thought he was just the cutest. Whether he was throwing leaves, pulling up his shirt to show his belly or entertaining everyone, this little guy loved all the attention. As I positioned the family in the back of the field to get ready for a run, the light looked so perfect. Everyone was smiling for me and then Mom and Dad lifted the little man to get some giggles and everyone turned to watch. Just a sweet family moment, and I love how those little ones just complete the family. Keywords: backlight (39), blue (138), boys (120), Charlotte NC (180), Family (171), Family Portraits (159), Summer (69). 1/320; f/3.5; ISO 500; 150.0 mm.